Blast off into space in Cazino Cosmos, a 5 reel, 20 payline slot game from Yggdrasil Gaming. There’s a real steampunk feel to this galactic adventure. Central to the action are the free spins. A standard trigger awards 10, 15 or 20 free spins with sticky wilds. Collect special wilds to trigger the 1 of the 5 different Collection free spins rounds, each of which comes with a special extra. Play on all devices from between 10p and £20 per spin. Design is usually one of Yggdrasil Gaming’s strengths and that’s certainly true of Cazino Cosmos which looks and sounds superb. A Heath Robinson-style spacecraft forms the backdrop to the action. On the reels you’ll see playing card suits, a cat in a spaceman’s helmet, a pair of mechanical style travellers and a moustachioed ship’s captain. The latter is the top payer, awarding 4, 30 or 200 times your stake if you land 3, 4 or 5 in a single payline. Wilds are central to the action in Cazino Cosmos. The standard wilds perform all the usual substituting functions. There are also special collection wilds. These also substitute for all other symbols bar the free spin scatter. When these hit, they are collected in their specific meter above each reel – more on this below. Land 3, 4 or 5 of the free spins scatter on the same spin and you’ll receive 10, 15 or 20 free spins in the Free Spins feature. Any wilds on display on the triggering spin are carried through into the feature and become sticky for the whole round. Any wilds that land during this feature also become sticky wilds. If you land a sticky wild on all 5 reels, an extra 5 free spins are added to your total. Reel 1 – Card Shot Free Spins – a pair of sticky wilds are added at random at the start of this feature. Reel 2 – Hack Free Spins – 5 extra free spins are added to your total here. Reel 3 – Zero Gravity Spins – the reels nudge up or down if that nudge results in a wild being added. Reel 4 – Mutation Spins – a higher paying symbol can morph into a wild on each free spin here. Reel 5 – Expansion Spins - wilds appear 2 high if this becomes live. Just like standard free spins, any wilds that land during the Collection free spins lock in position. Wilds on all 5 reels add another 5 free spins to your tally. 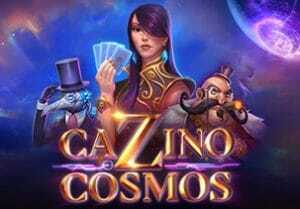 Cazino Cosmos is another highly entertaining slot game from Yggdrasil Gaming. The Victorian-style visuals are superbly done and there’s a fantastical feel to the orchestral score. The gameplay matches the design with plenty of wild and free spin extras to keep things moving. It’s terrible title aside, this is a very playable game and has the potential to pay out 11,821 times your total stake overall. I also recommend you try Cazino Zeppelin, also by Yggdrasil Gaming, which is the inspiration for Cazino Cosmos.